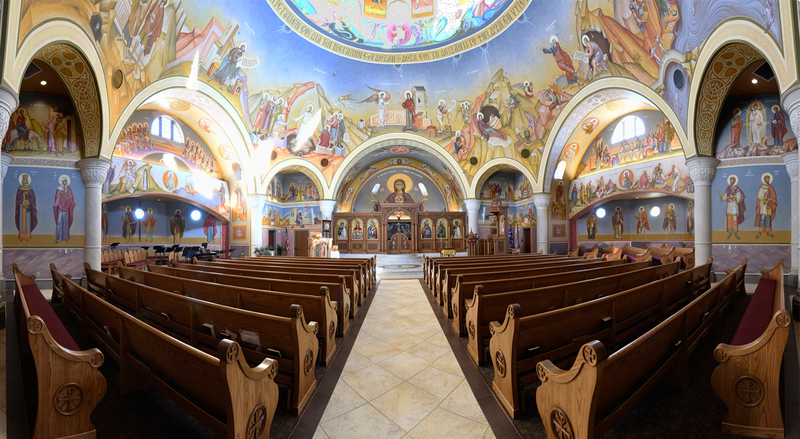 While traveling along the busy route 422 in Valley Forge, a hidden gem exists right off the Trooper Road Exit: Saint Sophia Greek Orthodox Church. Horst Construction built the 6th century Byzantine-style church in 2014 with ongoing interior finishes completed in 2016. From the exterior you cannot help but notice the stunning 30-foot diameter dome, crafted of red iron steel—an outstanding focal point of the surrounding community. A little history and context: Both the Romans and the Greeks influenced the architecture of the Byzantine Empire. Byzantine architecture began when Constantine rebuilt the city of Byzantium, renaming it Constantinople, and continued with his building of churches. A well-known example of Byzantine architecture is the basilica at the Holy Sepulchre in Jerusalem. The original Saint Sofia Church is the second oldest church in Bulgaria’s capital, Sofia, and dates back to the 4th-6th centuries. The interior of St. Sophia of Valley Forge is filled with museum-quality details that could capture your attention for an entire day. In addition to the beautiful hand-painted iconography covering the walls of the inner sanctuary, there is custom furniture throughout. The pews, as well as the choir seating, were all designed and handcrafted by New Holland Church Furniture, in Lancaster County, PA.
Each item is a piece of art—sanded and finished by hand—using a time intensive process that is a signature of the company, founded in 1919. Stain is hand rubbed into the wood, then cross-wiped to provide deeper grade penetration, intensifying and preserving the wood’s natural beauty. To ensure durability, New Holland Church Furniture uses a catalyzed finish that helps protect the furniture. Wood selection is another very important criteria, with preference given to certain species of trees. As a premier custom furniture source for unique church furniture, New Holland is no stranger to making beautiful, elaborate, and creative designs for congregations everywhere from the U.S. and Canada to the Caribbean and South America. With St. Sophia, the church committee started with more specific ideas about what they wanted, using photographs to illustrate the styles and types of furniture they liked. Along with creative input and the design expertise of Bob White, New Holland’s designer, they were able to integrate pulled design elements from the icon screen to create the end pieces on the pews. The St. Sophia pews include an upholstered seat and wooden back, along with bookracks and folding kneelers as customarily used in the Orthodox Church. From there, Bob began work on designing the church’s distinctive chairs requested for their choir seating. The committee liked the idea of utilizing ornate custom chairs for their flexibility in moving around the seating arrangement, but wanted to retain the connectivity that pews offer. The resulting seating was one in which three chairs were interconnected through shared use of a common leg, something truly unique. Established in 1919, New Holland is now the nation’s leading manufacturer of radius curved pews, boasting over 600 installations. New Holland Church Furniture combines old world craftsmanship with new world technology setting the industry standard and producing an investment that will last for generations. New Holland Church Furniture is the nation’s leading custom church furniture and synagogue furnishings manufacturer including pulpits, altars, bema furniture, and more. Thank you to CJK Design, the architectural partner for this outstanding project, as well as all of our partners who helped make this project a success. For more information on religious facility construction, please contact Rick Lown at 717.581.9913 or email RLown@HorstGroup.com.